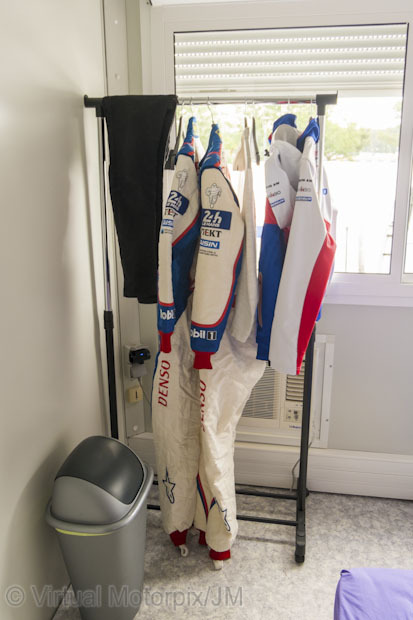 Where do the drivers sleep at Le Mans? To say there are a number of challenges to be faced when competing at Le Mans is an understatement. One of the main problems is keeping the drivers in peak condition to function at the highest level throughout the race. At Le Mans this is multiplied by 3 per car and like everything else this has to be planned to a meticulous level of detail. 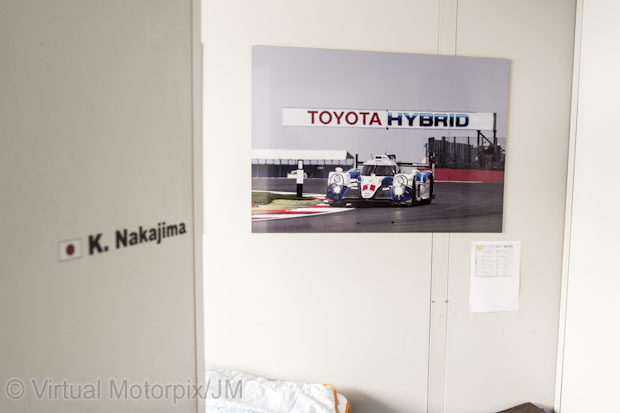 One very basic question that puzzled me, was where do the drivers sleep at Le Mans during the race when they aren’t in the car, attending briefings or keeping sponsors happy. 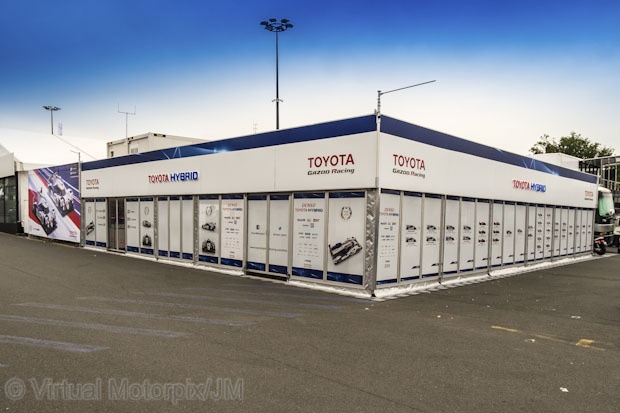 I met up with Alastair Moffitt, Marketing & Communications Manager at Toyota at the start of the build up to the 83rd Edition 24 Heures Du Mans who very kindly offered to show me round the drivers’ accommodation facility in the paddock. The public see a modest hospitality building where the great and the good can meet the team, and relax away from the hustle and bustle of the paddock, and where the autograph hunters stand in all weathers to grab a quick autograph as the pilots navigate between the garage and the paddock. 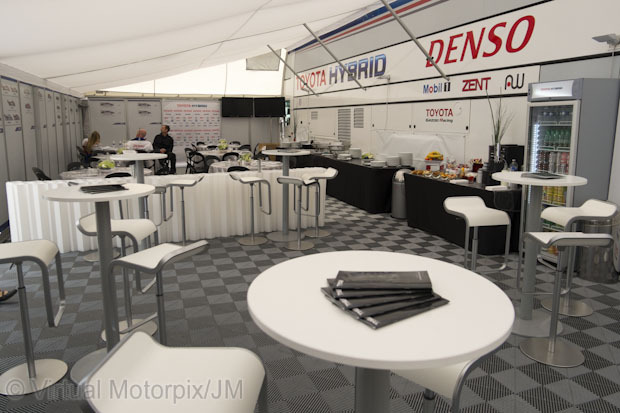 Once inside the hospitality building you enter a haven of peace with the trappings of corporate hospitality. Toyota may not be the most extravagant hosts but they are by far the friendliest and everyone you meet has a happy smile and welcome for you. Alastair was very relaxed and allowed me to snap away as we moved from the Hospitality area to outside and round the back to the accommodation facility, which from the outside looked like a block of double stacked shipping containers. 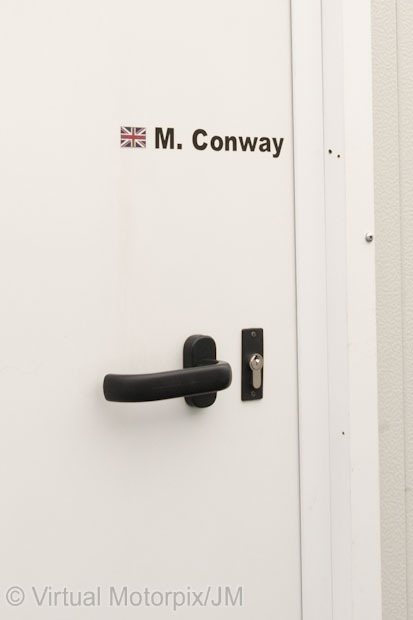 The only clue to the content was that the doors were very discretely marked with each driver’s name. All the rooms are the same so no squabbling amongst the drivers as they are allocated their rooms. 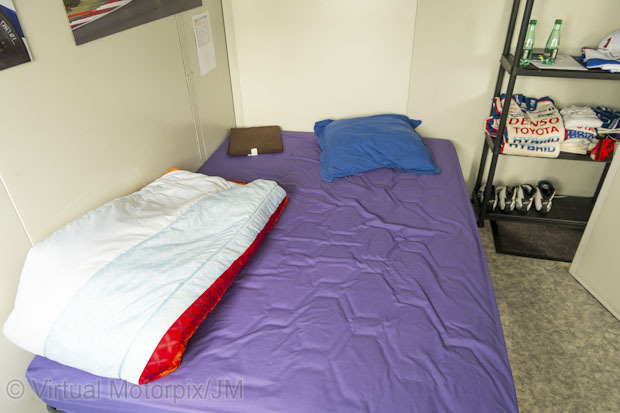 The drivers’ bedrooms are spartan and functional with a good sized bed with a proper mattress, duvet and pillows, a far cry from the camping chairs and quiet corner reserved for the mechanics in the garage. Each room has heating, air-con, wi-fi access and facilities to store clothing, even a poster of their company car hangs on the wall. Drawing on the teenage child analogy, when the drivers are in their bedroom they are expected to sleep or at least rest. The team ethos supports the view that, win or lose, they do it together and after a period of reflection when things have gone badly, drivers aren’t allowed to sulk in their room watching TV or playing video games. They are supported by the team in the rest of the hospitality facility. 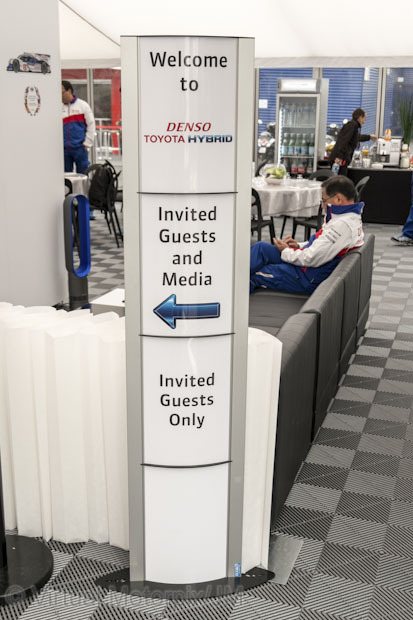 The Toyota team are very approachable and this presents problems when a driver just wants to pop to the bathroom, which otherwise could be over the other side of the paddock, it can be 20 or 30 autographs later before the mission is accomplished. To overcome this problem there is a functional array of toilets, showers and even a trusty washing machine within the accommodation block to keep up to date with the laundry! 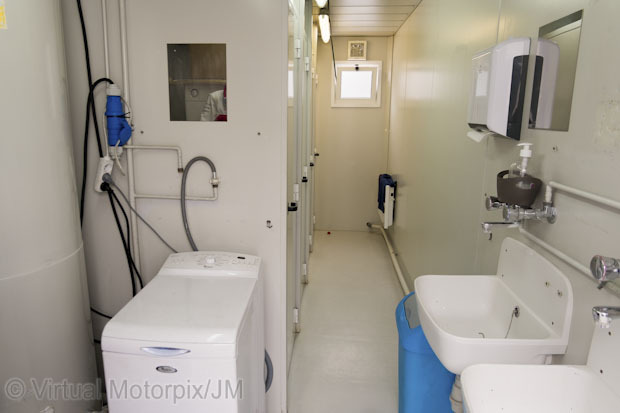 The final but probably most important part of the driver accommodation is the physio and medical provision. 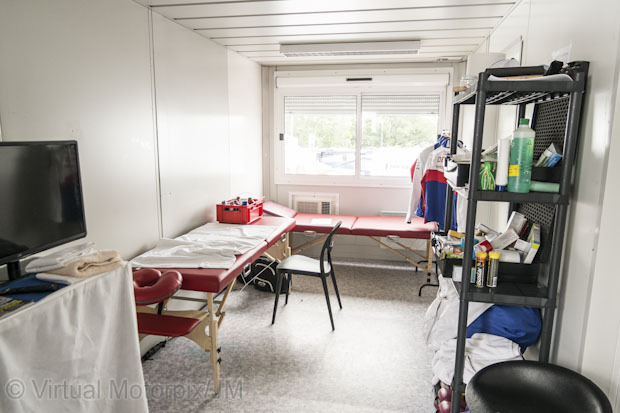 The team has two physiotherapists and a doctor to attend to the needs of the whole team and they are based just outside Anthony and Kazuki’s rooms. This is a serious rock and roll life style when you have your own en-suite medical practitioner! Toyota are currently working through a very challenging defence of their World Championship and it is clear from my time with the team today that attention to detail is not a weakness that will hinder them. And just like Le Mans they are in for the long haul built on strong foundations.